Ian Baird and Frazer Macdonald Hay row St Ayles Skiffs at North Berwick, down on the bottom right hand corner of Scotland. So, of course, they want to row round the entire country. As you do. 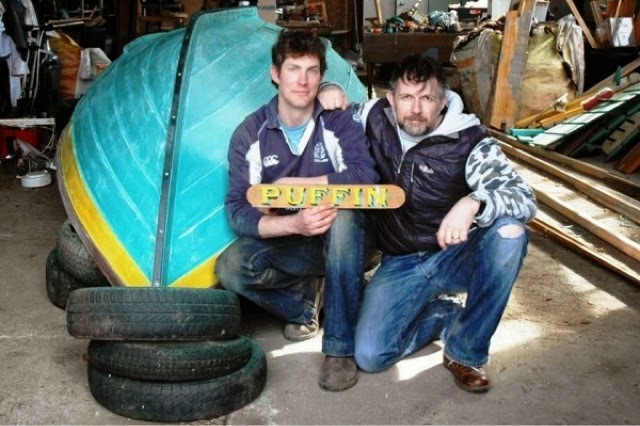 They have acquired and repainted Puffin, a skiff that was built for St Abbs but is currently unused. The original yellow and turquoise has been replaced with navy and white, and the original fancy bow adn stern carvings have been carefully removed for the inevitable GoPro cameras. Next problem: getting a crew together. They have solved this rather ingeniously by planning a row from club to club, offering rowers the chance to join in for just a short leg or for longer, more challenging distances such as Cape Wrath. The route takes them through the Forth and Clyde canal to Glasgow, up the coast inside the Western Isles and back down the east coast. Demand has been brisk, apparently, and the expedition is being filmed by the BBC for a doco. There is a highly entertaining and well written blog here: skiffaroundscotland.co.uk; and you can follow them on Facebook here: www.facebook.com/skiffaroundscotland. Glad I stopped by - I'd forgotten to check in on one of the rowing-across-things groups! Ocean Valour, found out about them when a friend from my kayak club saw them down by the Battery as they were preparing to depart!